Sopwith Camel by Nightbomber, SPAD XIII by Marechallannes, Dr.I by brdavis, and an Albatros D.Va by Hotlead Coldfeet. Phonix D.I by Kubajs, Hanriot HD.1 by Flying Officer Kyte, Macchi M.5 by Womble, and a Hansa-Brandenberg W.18 built and painted by tusekin. This round of fund raising is over and the winners have been notified. Thanks to everyone that has supported are LL program over the years. Sorry if I could not supply timely data, I was travelling and often offline. But you are very well organized without me. Four tabs, one for each control panel. Thank you for producing all those cards, Mike, and also thank you to all those supplying data about the new ships. It is supposed to resemble a Beluga whale, hence the name. Sabol Designs is running a Spring sale right now. Pluck foam but made well and a pretty good deal. You can source Pups from Shapeways. Here is a pic of mine. Thanks David. Best Wishes from Australia. Sure looks like a Dolphin in that second photo. 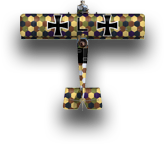 Official Fokker Dr1 painting thread. Thanks. There’re highlighted on the Jacobs too but it didn’t show up on the photo. More visible to the eye. Great - off to the Kobo Store to see if I can download a copy for my e-reader! Date Changes, Again . . .
That must be a strange plane to fly. Just got a copy for my Kindle Matt. Right back at you David ! A Happy and Blessed Easter to all our members!